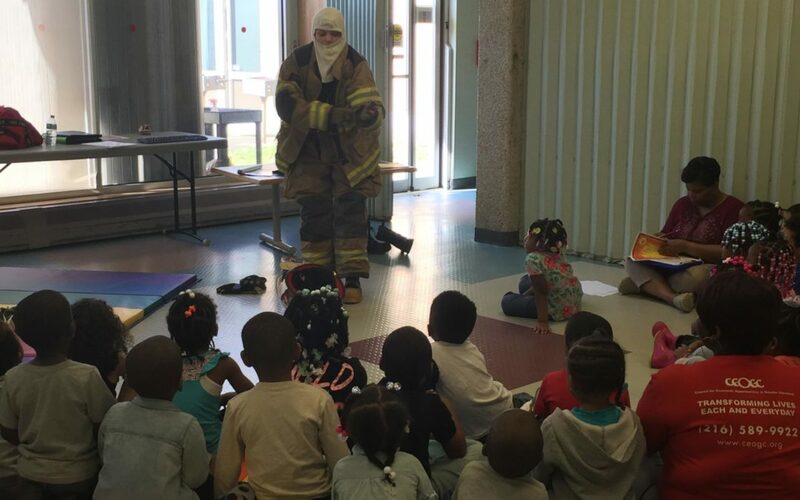 Preschoolers at the Green Road Head Start Center learned about fire safety from a Lieutenant at the Highland Hills Fire Department on Wednesday. Lieutenant Vanessa Sheriff visited the students to teach them about firefighters and how to react if they’re ever in a fire. The kids learned about firefighters and what they do. They also learned about the gear a firefighter uses during a fire. Vanessa brought her gear to show them! The students loved learning about each piece of protective clothing. Vanessa explained that a firefighter can sometimes look scary when he or she is fully dressed in protective clothing, but assured the students that firefighters are there to help them and they shouldn’t be afraid. Vanessa also told the group that they should never hide if they’re stuck in a fire. That way, the firefighters will be able to find them when they’re inside. The students watched an educational movie about firefighters and learned how to stop, drop and roll. They also learned about what common household items could create a fire hazard so they could be more prepared to make good decisions when they encounter them. At the end of the class, each student got his or her very own firefighter hat and a certificate saying they completed the course. It was clear the students had a great time and learned a lot! Thanks to our friends at the Highland Hills Fire Department for helping to keep us safe! 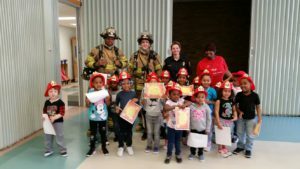 Each student received a firefighter hat and a certificate. They loved learning about fire safety!